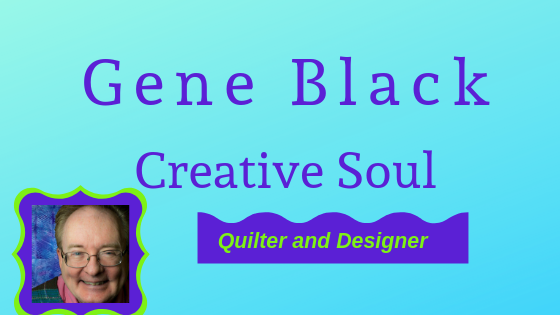 Gene Black an Alabama Artist and Quilter: Fun Play "Project"
This being a kinda lazy Saturday, I decided to use some scrap pieces and make some string quilt blocks. I did these on muslin foundation squares that I cut 10" square. Since I have a 9.5" square ruler (the largest square ruler I own), my plan was to trim them to 9.5" and I did. That gave me a little bit of leeway for error. I did fine on three of the four blocks. Somehow on one of them I was "off" with one of the first two strips I put down and it didnt go to the edge of the muslin. Whew, thank goodness for some error room! So here are my four blocks laid out. You will notice that I didn't measure the strips (on purpose) so it doesn't line up perfectly. I think it adds a little interest to the block. I ain't afraid of no quilt police! hehehehe. Ahhh...nope, you can't tell which one I "messed up" on, now can you! Great work! 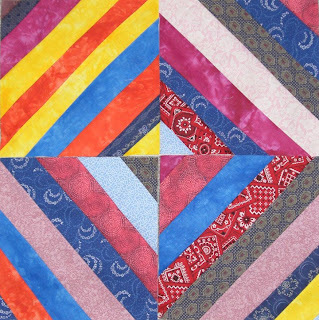 I LOVE string quilts! I haven't made one yet, but getting ready to SOON! I'm still organizing my stash according to Bonnie Hunter's (Quiltville) method. I have a LOT of stash, so it's taking me a while! String quilts are terrific....no need to worry about whether or not the center pieces match up...that's the beauty of it. I have a HUGE wicker bin full of scrap strips and intend to do a string quilt at some point. Thanks for sharing the photo and show us more as you complete them! Mr. Black, Officer Wheeler here.. I need to confiscate this quilt when it is finished! FOR EVIDENCE! I think no making each string the same size gives it some dimension...it looks great.